Quality system certified according to ISO 9001:2008 for the design, manufacture, distribution and sale of instruments for the measurement and control of noise. Our quality management system is certified according to the requirements of ISO 9001:2015 for activities of design, manufacture, calibration, verification, distribution, sale and post-sale of equipment for measurement and noise control. The main objective of implementing the internationally recognised quality management system ISO 9001 is the satisfaction of our customers. 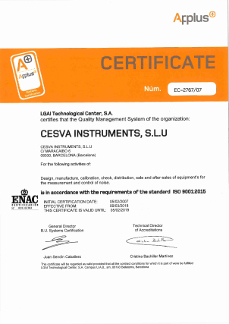 Cesva obtained the Registered Firm Certificate and the right to use the APPLUS mark for the registered firm EC-2767/07, in accordance with the requirements of the standard ISO 9001:2015.